Today's readings deal with faith and seeking God. The first reading tells us of Elijah where he was about to have an encounter with God. 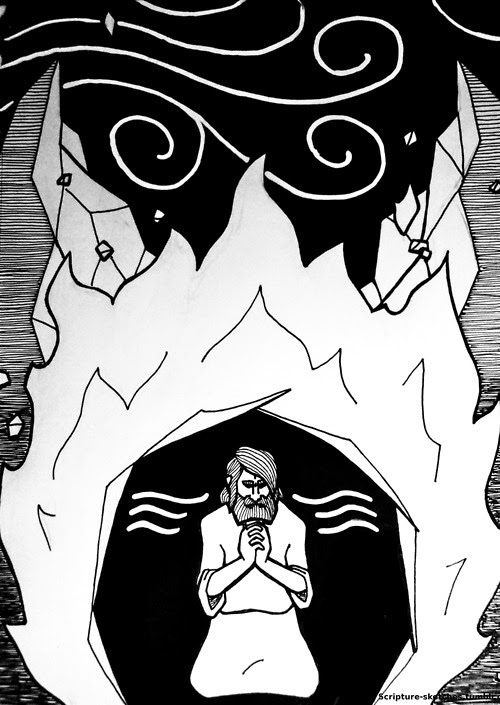 Elijah is on the mountain Horeb near a cave where he took shelter from the elements. God tells him to wait beside the mountain because He will be passing by. This is of course anthropomorphic language. The reading tells us that strong and heavy winds or gusts came by. Rocks came crashing down, but God was not in this commotion. Next, there was an earthquake, but God was not in that event either. Fire appeared, yet God was not in this fire despite speaking from a burning bush to Moses in the past. Finally, there is a tiny whispering sound and it was then that Elijah realized God was present and hid his face. This reading is interesting because the author gives us an anthropomorphic look at God. He is "passing by," the text tells us. Scripture often uses anthropomorphic language in order to describe God. This was used because of the limits of human language; not to mention the fact that no words can truly describe God, so man has to use what he knows and has in regards to language and experience to best describe God. Anyhow, the text gets very geologically and meteorologic-ally specific. It seems to be describing an earthquake or perhaps even volcanic activity. There's a reason why these details are there. The Hebrews/Israelites were always under captivity or influence from nearby cultures, namely the Canaanites. Israel was a kingdom at the time which eventually became divided into the Kingdom of Israel and the Kingdom of Judah. Like in medieval times in Europe, kings or queens often married royals from other kingdoms for political reasons. These marriages can provide unity of two kingdoms, or even bring about peace and a better economy. Humanity in the 9th century (BC) was no different. The king at the time, Omri had his son Ahab marry princess Jezebel the daughter of the king of Sidon. This marriage brought some security and an increased economy. However, Jezebel was also a priestess of the Canaanite god Baal. Because of this, Ahab was influenced by her and he introduce the worship of Baal to the Israelites. He even had a temple built in honor of this deity. prophet Elijah comes into the picture and warns Ahab of a drought. Elijah is basically trying to restore the faith in the kingdom. He does so even to the point of making a mockery of the priests of Baal which is a hilarious account you can find at 1 Kings 18:25-27. Pagan gods were often described via natural events. They controlled lightning, earthquakes, storms, fire and what not. Those who believed in them saw these natural phenomenon as signs or manifestations of Baal and other gods. This is why the first reading goes into detail about God not being in the strong winds, earthquake, fire. The reading is making it clear that the one God does not depend on His creation to introduce Him. Nature is not an opening act for God. Atheists often believe Christians think God is literally behind every natural phenomenon. This is the "god of gaps" fallacy. Anyhow, God is present in the silent whisper completely contradicting what the Canaanites believed in regards to how a god manifests himself. So the first reading reminds us that God is God and doesn't need nature to manifest Himself. It reminds us that God will not always be so obvious. We have to be patient and wait in silence to hear that "soft whisper." In the responsorial Psalm, calls us to seek God; reminding us that He is kind and brings salvation. This Psalm is of course a parallel to the first reading because the Israelites were forgetting the one true God in favor of the gods of the Canaanites. We cannot forgot the one true God by replacing Him with the false gods or idols of today. These false gods may sometimes come into our lives like a strong wind, earthquake and fire causing us to believe in them more that in the true God in the "soft whisper." The second reading reminds us that Christ comes from the Israelites. He is the fullness of the faith given to the Israelites which we read about in the Old Testament or Hebrew Scriptures. The many laws, journeys and covenants the Israelites received were in preparation for Jesus Christ who fulfills the law, covenant and brings meaning to the suffering of the Israelites and all of us today. Finally in the Gospel, we are told of more natural phenomenon which is connected to the first reading. This Gospel account continues from the feeding of the large crowd in last Sunday's reading. It tells us that Jesus told the disciples to get into a boat as He went up on a mountain to pray by Himself all the way till the evening. At the same time, the disciples were miles away on the boat and a storm approached causing the boat to rock to and fro. Jesus then approached them walking on the water. At first, they didn't know it was Jesus. They thought it was a ghost and were scared to death. Jesus spoke to them and told them not to be afraid. This is when they realized it was Him. Peter, being a skeptic wanted to make sure. He asks Jesus to verify if it's really Him by asking Jesus to command him to go to him on the water. So Jesus naturally said, "come." Peter got out of the boat and started to walk on the water towards Christ. However, when Peter realized how strong the wind was while the waves were crashing all around him, he got scared and panicked. Immediately, Peter began to sink and shouted to Jesus to save him. Jesus reached His hand out to Peter and told him, "O you of little faith, why did you doubt?" Jesus then joined them and the disciples realized that this Jesus guy was no joke. He was the real deal, so to speak. This Gospel is very powerful indeed. First we are told about Jesus going on the mountain which is connected to God on mount Horeb. Then we are told of the stormy weather that rocked the boat the disciples were in. This is connected to the stormy weather on Horeb that Elijah faced. Jesus was not in this stormy weather just like in the first reading, God was not in the strong winds. Next, the disciples see Jesus walk on the water and think it's a ghost. I don't blame them. How many of us would freak out if we saw someone walking on water? I know I would personally go into cardiac arrest if I ever saw that in person! Anyhow, they are scared seeing this figure walking on the water. How many times do we get scared of the spiritual? We get scared to believe; to have faith? Religion becomes like a scary ghost; an obligation we want to run from, right? We have to be like Peter and respond to God in faith even if we may not truly understand what's going on. Peter calling out to Christ to prove Himself tells us that the spiritual life is a 2 way street. When God comes and seems like scary ghost, we must communicate. We must be the ones to initiate the dialog via prayer. Christ then becomes clearer when we do this. He is no longer that scary ghost we saw at first. The next part is harder. Christ calls on Peter to come to the water with Him. Peter being the oldest probably wanted to show off and be the one to step on the water. He did fine until he looked down and around himself and saw the stormy waters. It was then that he doubted and began to sink. Notice that Peter was walking on water without issue as He was looking at Jesus. However, when Peter looked away, that's when he began to sink. How true is this! When we focus on Jesus, we can walk on the water, so to speak. Nothing can stop us! However, once we turn away from the face of God, we realize the drama of the world, the stormy world we live in and the liquid surface our lives stand on and then we begin to sink. The sinking of Peter shows us how life sinks into the stormy water when we are not looking at Jesus and trusting in Him. God is most likely not going to appear to us with fanfare and what not. We have to seek Him in the silence whisper. In the silence of our minds and hearts we can find God. This is a higher level of consciousness and reasoning. When we find God, He will seem like a scary ghost at first because we are so used to seeing other human beings, the material world and what not. God will naturally come off as alien to us. However, when we hear His voice, we then see clearly it is Him. God then calls us to Himself, but in order to go to Him we must have faith just like Peter did at first. This faith will allow us to walk on the stormy waters of life defying nature and human existence itself. However, if we get distracted and look at the winds of the world that give us chills and try to knock us over, then we will sink. If we look at the "solid" ground our lives exist on which we think are secure, we realize that it is not. It is merely a liquid body of water with restless waves crashing about bringing about anxiety and panic to our lives until we drown in it. Jesus is the life guard. He is the life saver. 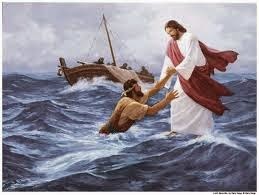 Seek Him and you can walk on any water in life not caring about the storms of life that may hit you.